This has got to be hands down one of the best purchases I have ever made at F21. This dress was suuuuper affordable, and I get compliments on it constantly, which I attribute to the print not looking like a cheap floral, as well as the cut. I just took quick snaps, so forgive me on the lack of detail here, but this dress is a high-neck cut that ties in the back above a V-cut, and has a little bit of a cut out in the front. The length is perfect for me, and the gathered waist is flattering. I typically wear this with minimal jewelry, maybe just a bangle or two to offset. I feel like my arms are an area of my body I could improve on. We all know I have long monkey arms, you should see the monkey photos my sister loves to tag me in (ugh), but they’re not overly toned. Definitely room for improvement, but I feel like a high-neck dress or top is always a flattering choice, whether you’ve got great noodles going on or not. It draws attention upward, leaving just the right amount of skin showing to accentuate your arms and shoulders, and works whether you’ve got a big set of twins or small. This dress is appropriate for all occasions and I actually would say I wear it way more casually than I do in dressy situations. It’s just the right amount of easy-breezy middle ground for summer, paired with flat sandals it becomes a really great option for day-to-night transition without feeling underdressed or obligated to wear heels. Easily the best $16 I have ever spent at F21. Well done. Photos by the lovely Miss Kelly Black. I get it, we’re only 2 degrees off from having triple digit heat as I write this, so I understand the need to lose some layers, however, let’s keep it socially acceptable people! When I need to beat the heat I tend to go for sheer gauzy fabrics, flowy tops and dresses that provide some comfort and ventilation, a fun mani-pedi, and of course bright summer colors. I recently celebrated a friend’s birthday at one of my favorite places, Malibu Wines Tasting Room, deep in the hills of Malibu. It was an awesome afternoon sipping on chilled wine, snacking on cheese and crackers, and attempting to stay cool in that pre-summer sun that is just relentless in the open California air. Being it was a semi-casual birthday vibe, I of course took the opportunity to wear one of my fun summer sundresses, keeping it casual with a breathable bralette as my choice undergarment, and flat sandals. My wonderful friend Kelly was kind enough to snap a couple of photos for me before the sweating got too intense! I absolutely love bright florals, and I jumped at the chance to wear this dress paired with a fun fuschia clutch and coordinating nail color. For those who don’t know, yellow, especially a golden/canary yellow, is my favorite color, and the bright colors in the floral of this dress means I have a lot of options for adding brightly colored heels or accents to the outfit. This print is about as easy as color mixing gets! Dress: Urban Outfitters, available on clearance in stores, or similar options here, here, and here! Shades: F21, recently back in stock! I got this little floral dress for Christmas in 2012, and though it was a part of the Urban Outfitters fall collection, it transitions really nice year-round. That said, this particular color and print looks adorable with so many different add-ons to handle all sorts of occasions. My life is pretty casual as of lately, with the holidays being over, so a casual dark green military jacket gives the fuschia color an unexpected color match. Sometime soon I will do a post on color mixing, and using the opposite ends of the color wheel to create unique combinations that are still easy on the eyes. For now, this little cap-sleeve, button-front, floral dress has been paired with things like tights (all colors), boots, worn as a skirt with oversized sweaters, vests (of the faux fur, denim, and military variety), as well as leather jackets. Not to mention sandals and flats for spring and summer-time. This look kept with the California winter vibe, adding the jacket, wool scrunched socks and wedge lace-ups, with minimal accessories and a fresh coat on the fingernails. Originally Posted 10/23/13. It’s finally almost starting to look a bit like Fall in certain areas of LA. Beverly Hills has leaves turning, so it inspired me to get colorful. I absolutely love pairing unexpected prints and textures together. Sometimes, you don’t really need anything new in your closet like you think you do, you just need to get creative. I am no stranger to color in my wardrobe, and I always encourage people to give up their safety net of neutrals and solids when shopping. Branch out. Buy something you would normally pass over. For some of you this might be a big step, so maybe start lower-priced. Like Tobi.com or Forever 21. Mixing color uniquely really doesn’t take as much talent as people think it does, and you’ll know by looking at it if it works or not. This year, the jade and emerald green shades were everywhere, almost so much that they became a neutral for me in my wardrobe. 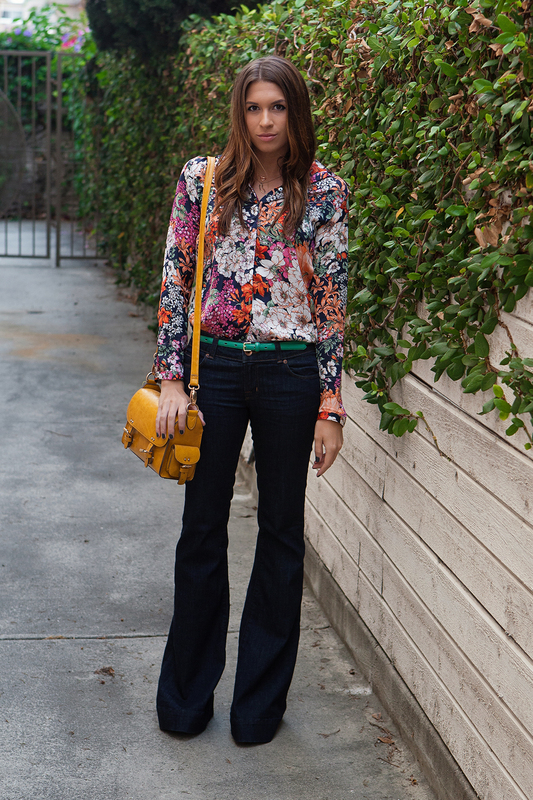 For this 60s inspired outfit today, I pulled out the wide leg flares, a fur vest, and lots of color. 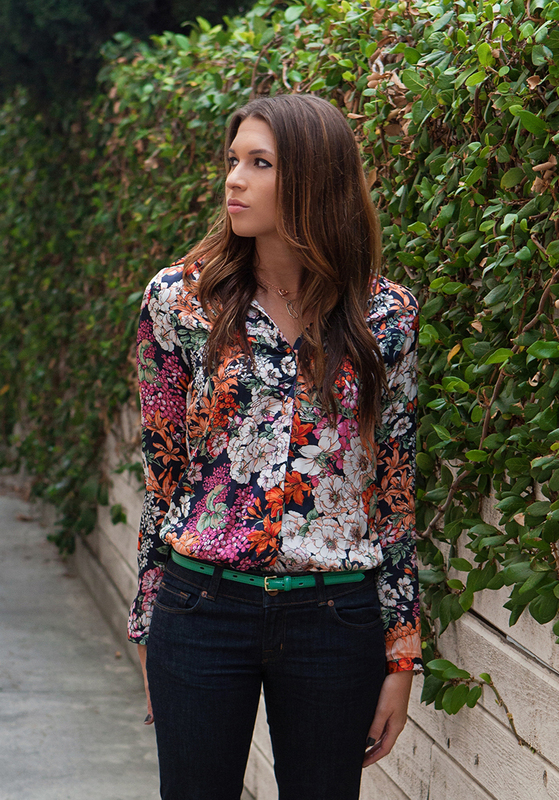 Can’t go wrong with florals and fur! If Jane Birkin and Janis Joplin could do it, so can we.